Travel Videos are easy to make when you use a camera tri-pod, however carrying around a camera tripod is almost impossible for a world traveler. 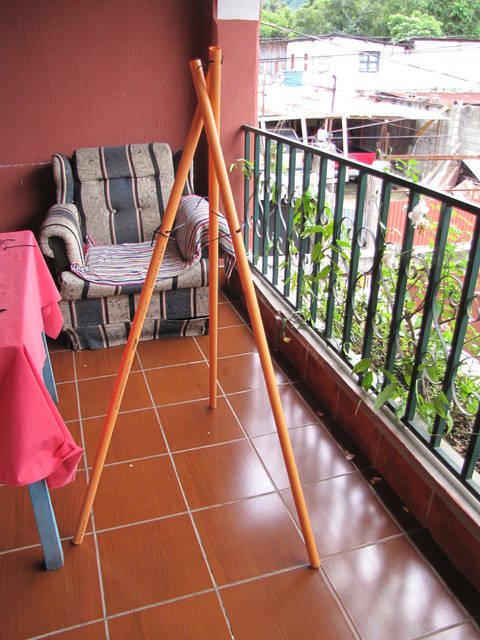 How to make a Camera Tripod? But, and there is always a but, to travel and make videos, you need someone to hold the camera. Well, it is very difficult to find, it is almost impossible to find a person who can hold the video camera correctly. This is the solution, here is a cheap, easy to make tripod made out out 4 dollars worth of plastic electrical conduit. This is truly a windfall, it works great, and you can adjust the height by cutting holes at different levels. Just too easy, this is how to have a camera tripod without all the hassle of buying or carrying one on a plane. Note, you will not look like one them goofy photographers, and you will not get robbed like the normal duffus wanna be pro photographers, who spend all their money on gear, but never accomplish anything. You do not want to look like a pro, it is the best way on the planet to get robbed. Hint, want to know who is the pro? He or she will have 2-3 camera hanging around their neck, not one. Andy Lee Graham on Lago Atitlan, in Guatemala. Andy, this is a great tip! It's almost a bushcraft tip... you can make a tripod out of saplings to suspend a pot over fire, too... yours is a kind of urban version of ancient wisdom, and very useful. Ash --- One of my favorite people on the planet? Why, because he challenges me to learn, or extends my knowledge, not an attaboy, or negative, he extends my understanding. ----- Bushcraft --- my lesson today ---- Bushcraft is a long-term extension of survival skills. A popular term for wilderness skills in Canada, the United Kingdom, Australia, New Zealand and South Africa, the term was popularised in the southern hemisphere by Les Hiddins (The Bush Tucker Man) in Australia as well as in the northern hemisphere by Mors Kochanski and recently gained considerable currency in the United Kingdom due to the popularity of Ray Mears and his bushcraft and survival television programmes. It is also becoming popular in urban areas areas where the average person is separated from nature. Bushcraft is about surviving and thriving in the natural environment, and the acquisition of ancient skills and knowledge to do so. Bushcraft skills include firecraft, tracking, hunting, fishing, shelter building, the use of tools such as knives and axes, foraging, hand-carving wood, container construction from natural materials, rope and twine-making, and many others. These are the kinds of skills well known to our ancient predecessors, many of which are still practiced today as an everyday skill amongst aboriginal and native peoples around the world. Thanks, Andy! I guess I figure knowledge should be shared... your tips and tales enrich the lives of many of us and help us learn new things. This is the kind of bushcraft tripod I mean: http://www.youtube.com/watch?v=QIm3JmfT59w used for cooking in the wilderness, they are surprisingly sturdy although slightly trickier to make than he makes it look...! Mike, what a good idea, I could make it a prize, the van is all outfitted, and incredibly comfortable. It went through Loveland Pass without a problem in Colorado. I almost dumped it over a clift in Colorado, but a reader Ken sort of talked me out it. Finally, I realized it was good to have if my parents get too sick, so I paid my dad 50 USD per month store in his garage, which is good for me, and good for him.